The Bannon-Ryan Common Ground: A tax reform plan. Specifically, the border adjustment plan that would raise tax imports. Bannon has told associates he believes the evolving Ryan-Trump tax reform program "is a strong American nationalist program." Attaching Ryan's plan to the word "nationalist" is the highest praise Bannon can dole out. 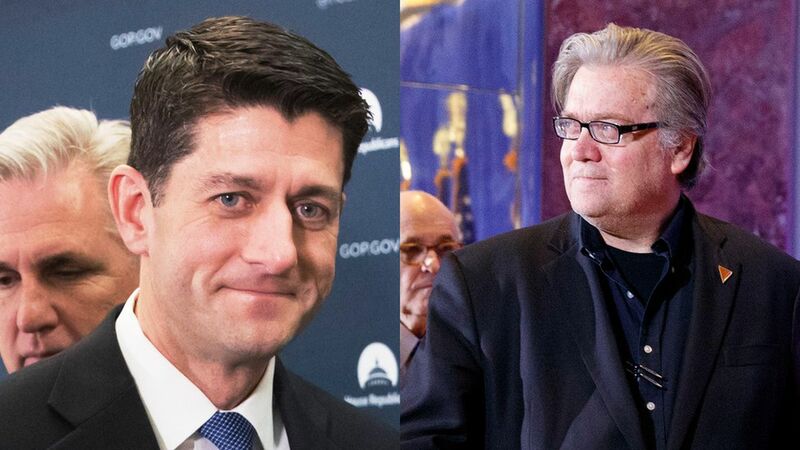 When he was chairman of Breitbart, Bannon viewed Ryan as a "globalist" enemy intent on undermining American sovereignty through open borders and free trade. Why it Matters: The fact that Trump's chief strategist believes the tax plan is following nationalist principles means it has a better chance of success. Ryan is seizing the opportunity. In private meetings with Bannon and senior staff, the Speaker has described the border adjustment plan as "responsible nationalism," according to someone in the room when the Speaker said this. Ryan and Bannon are, in a limited way, talking the same language. Ryan is making the pitch that the border adjustment policy — the key to funding Republican tax reform — would level the playing field for American jobs and American-made goods. He's using the language of Trump's populist movement. But their unity has limits: There's no sign these two have — or will ever — come together on either trade or immigration, but tax policy is a different story. Seeing eye-to-eye on tax reform has allowed for a slight thawing in the personal relationship between Bannon and Ryan. But don't believe anyone who tells you they're becoming buddies. Says a source close to Ryan: "It's fair to say they have agreed on our tax plan and made a connection over this particular issue." What's Next? Trump has given mixed signals on border adjustment. He trashed the idea to the Wall Street Journal last Friday. But a few days later he told us that he wasn't so opposed to it after all. It wouldn't surprise us if Trump ultimately backs the plan.